The brand new Kymco Like is here. 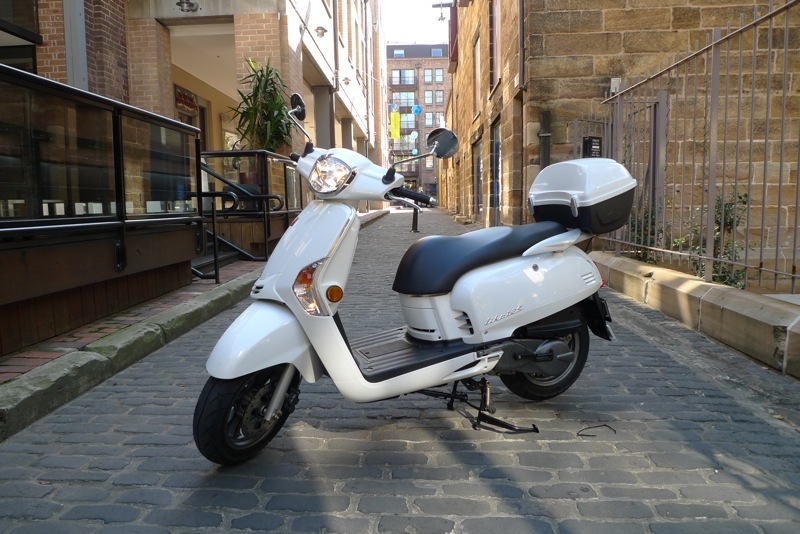 Scootersales.com.au was first in Australia to review the newest classic from Kymco. Kymco have a host of new scooter models ready for launch in 2010. 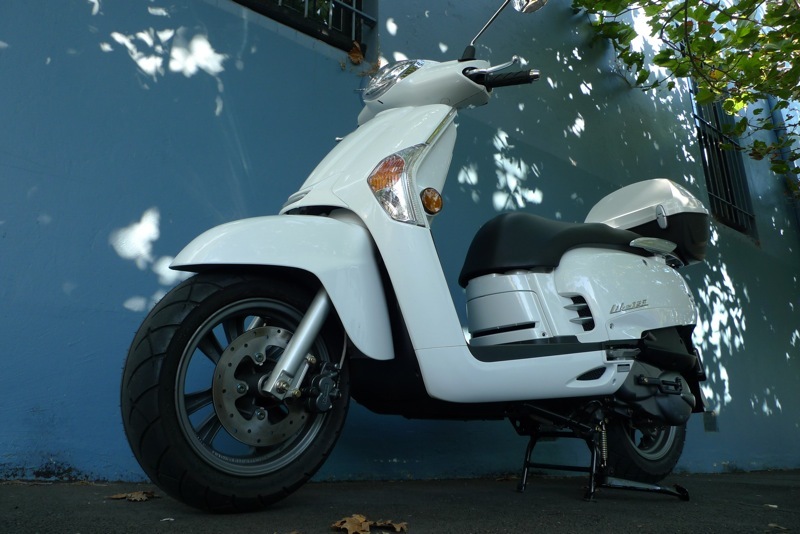 The first scooter is the Like, available in both 50 cc 4 stroke and a larger capacity 125. The Like would have to be one of the most highly anticipated models to come out of Taiwan from the Kymco brand. Scooters like the Espresso have been the backbone in Australia for many years. Having the Like in the Kymco range will not only inject a huge dose of style and class, but also give the brand a value for money "shot in the arm". 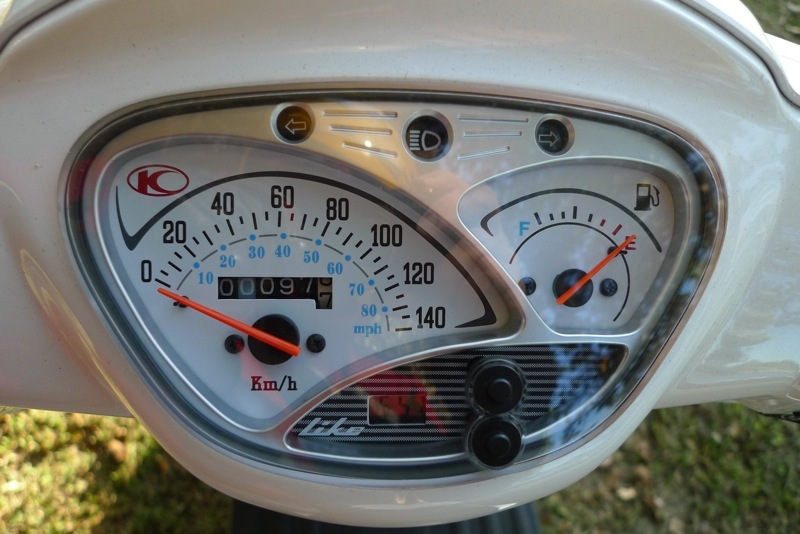 The big feature on the Kymco Like is the style. Very classic whilst still being individual to a point. The lines are clean cut and it looks somewhere in between that Vespa and Lambretta look. Kymco have taken maybe what they thought to be the best of both and moulded them into one neat package. From the chrome surrounds on the headlight and fairing, the even larger rear tail-light or even the long vented elongated panels down the side, the Like just has a nice non offensive coolness about it. Kymco have thought long and hard about this model, practicality reigns supreme and a whole host of ideas have made there way to the production line. First up lets look at the host of storage options on the Kymco Like. We have a colour coded top box standard that uses the same key as the ignition, a full face helmet will fit in here no problems at all. Under the seat is half helmet territory, though we do have two helmet hooks if required. You open the seat via a lock on the side panel, again same key. A flat floor with bag hook just in-case your carrying more then you anticipated. Finally we have plenty of room in the large glove-box which also features a handy 12 volt charger. Nice touch is the clear plastic strip that stops articles from falling forward once the glove-box is opened. The dash is keeping in theme. Very classic and very analogue apart from the small digital clock. Just fuel and speed but really what more is required. Switchgear looks and works a treat and its all pretty much standard affair. Lights have their own separate switch to turn on and off. Nice feature on all Taiwanese scooters is the audible blinker indicator, a small warning for when you leave the blinkers on. The wheel package on the Kymco Like is another bonus, 12 inch front and rear. The grey spoked alloy rims may be understated but I reckon they help draw attention to the lines of the body. The Like has a strong and powerful disc brake front and rear. Twin adjustable shocks take up the suspension duties on the rear. The side stand is one of those spring mounted self retracting jobs. 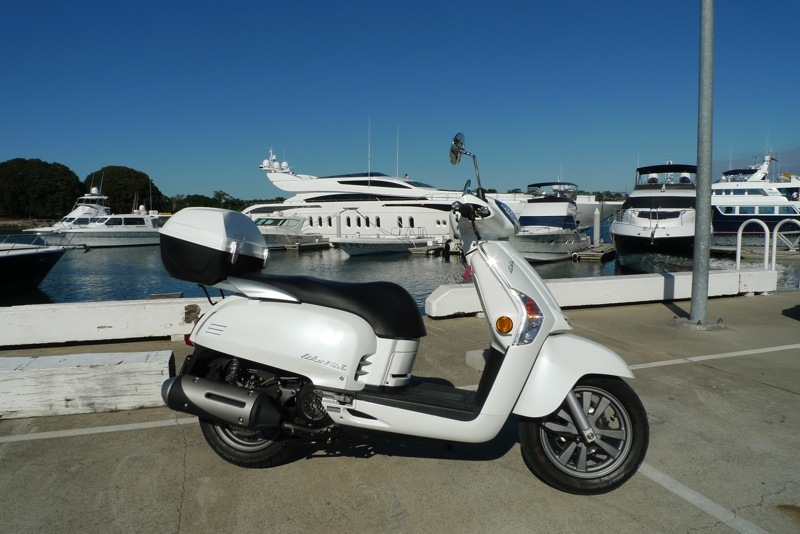 The engine on the 125 is a fairly spirited 4 stroke number that achieves a 7kw output. The weight, for what is a largish scooter, tips the scales at just 116 kg. The fuel tank comes in at 7.5 litres in capacity. All these well thought out features are relevant across the entire Like range, from 50 cc through to the upcoming 200 version. You can really see the lengths that Kymco have gone to in getting this package right. Sure there is nothing new here, but Kymco have very much taken the best of everything and piled it into one sophisticated model. For the price its exceptional value. It makes my job pretty easy when a new scooter backs up features with on the road substance. 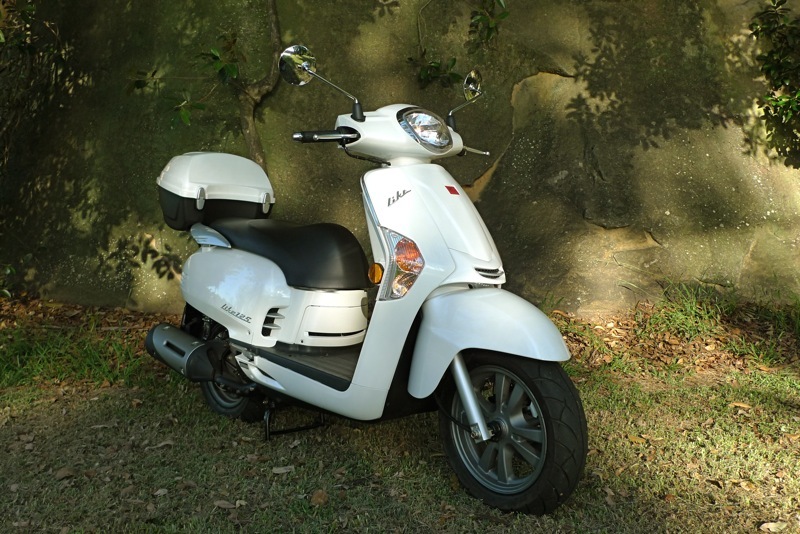 The Kymco Like takes up the riding position of most classics. Comfortable and upright, and nice and low to the ground. The seat is broad and wide, the bars angling back for a short reach. The handgrips a nice and thin and its all very compact and neat. The front does angle back which may impede the knees of the really tall, for me and the majority, no problems at all. The seat is long and flat and doesn't lock you into place so its nice to be able to move around and find your own comfort zone. The Like is not small. So you do feel you have a great deal of scooter around you. The front end is wide and angled back so protection from the elements seems a little better then normal for some reason. The motor kicks into life easily, its fairly quite. Acceleration and performance are pretty much on par with the competition and your daily commute wont find any boundaries. Smooth and fairly brisk away from standstill you wont have any trouble at all keeping up with fast moving traffic. When it comes to light motorway applications our test bike, although only having under 100 km's on the odometer, still managed 100 km/h. Comfortable cruising is 90 km/h and the engine/transmission seems tuned to cater for this. The suspension is oddly very firm. Cornering is sharp and this is all enhanced by the 12 inch wheel combination. The chassis certainly keeps up with the performance output of the engine. The Like is extremely dynamic on high speed smooth surfaces but can crash a little over slow bumpy stuff. But that's the trade off in getting the Like extremely focused on the job at hand. The Kymco engineers build good handling scooters and the Like is no exception. Brakes are particularly good and its all because its disc up front and back. They pull up the 125 easily. This could be the same braking package on the upcoming 200 model and still be sufficient. Passenger comfort is pretty good also. Top marks for the push button flip out foot pegs, nice feature. The Kymco Like will be everything the Australian distributor and dealer network has been waiting for. A terrific looking scooter, Kymco have gone to lengths to get this one right. Just look at the chrome strips on the front fairing or the cut out grills in the side panels. It looks every bit a winner just standing still. The fact that Kymco have backed this up with a fair amount of dynamic ability will mean that you can take confidence in the knowledge that Kymco have done the job on this one. Some of the features are just well thought out and you can see the lengths that have gone into the design brief. All this in a package that retails for just $2990 + ORC for the 125 model. The Like will be up against a fair amount of competition in this budget segment, it might just be some of the small things that get it over the line. A well thought out machine by any stretch. The Like comes with a 4 year conditional warranty. Service intervals are at 300 km's, 1000 km's and then every 2000 km's after that. Who comes up with these model names??? Apart from the name it's a nice looking retro style scooter. I bought a brand new Super 8 125 about a month ago & am really impressed, although it is the 1st Scooter I have ever ridden so have nothing else to compare with. Mine seems to be a very well built & reliable machine so if the Like is anywhere near as good as the Super 8 it will have a lot going for it. Certainly looks like it would really look the part cruising around the streets of some little Italian village.